The recurrence of pleomorphic adenoma has particular characteristics. For the patient, it is a significant stress, because rarely is a single surgery sufficient to solve the problem. This is only evident when recurrences are removed at the time of surgery to avoid unnecessary risks of lesioning the facial nerve. Contemporarily, other microscopic recurrences may not be visible (by clinical examination or MRI) but will become apparent later and subsequently require surgical removal. This phenomenon may occur due to seeding of the adenoma (shedding of parts of the lesion in the surrounding glandular tissue) during the first surgical removal. For the surgeon , the main problem is the need to spare the branches of the facial nerve adjacent to the recurrence(s). If an appropriate microsurgical technique is used during the first intervention, it is easy to save facial nerve branches; during any subsequent intervention, the operation becomes much more difficult. This is because the fine branches of the facial nerve, white and brittle, become immersed in extensive scar tissue, also white but extremely robust. In fact, it is simply not always possible to separate the branches of the facial nerve from the surrounding tissue, sometimes forcing the surgeon to sacrifice one or more of them. 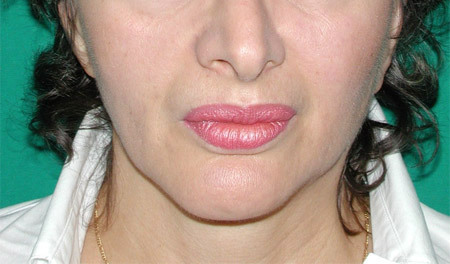 In the most complex cases, all the branches of the facial nerve have to be sacrificed, inevitably resulting in facial paralysis. 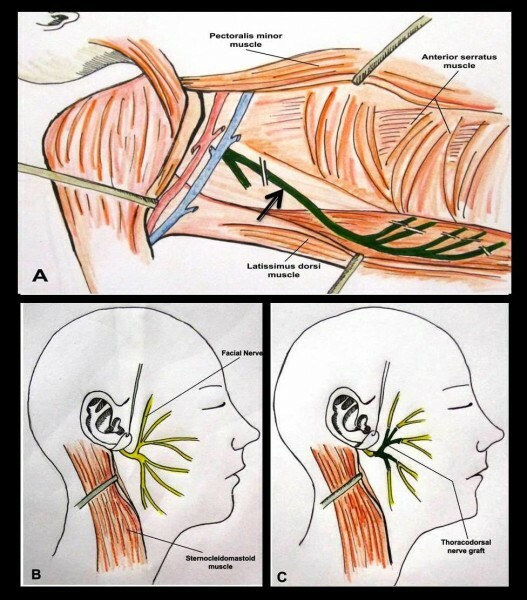 To prevent this situation from becoming permanent, Prof. Biglioli proposed in the international scientific literature the immediate reconstruction of the entire branching of the facial nerve, with the thoracodorsal nerve and its ramifications. Removal of the latter nerve does not involve appreciable deficits for the patient, while reconstruction of the facial nerve in this way allows restoration of the symmetry of the face at rest and performance of the most important movements, such as smiling and eyelid closure. 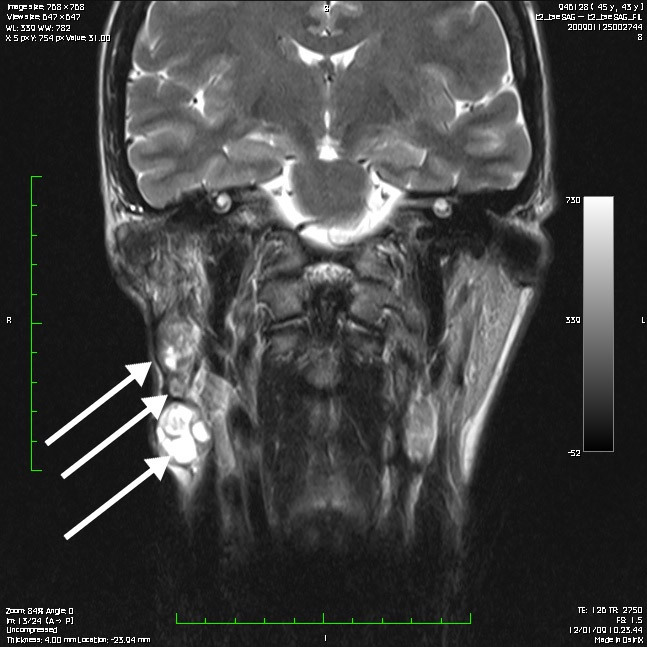 MRI of multiple recurrent pleomorphic adenomas (arrows), recurring after multiple surgeries. 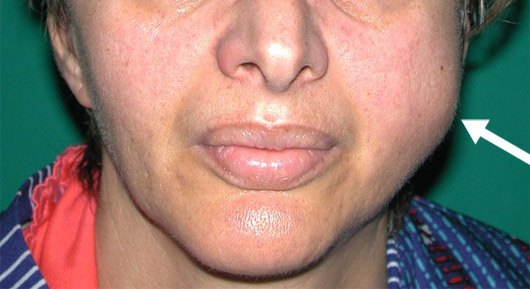 In performing radical surgery, whole parotid gland removal was chosen, together with the entire facial nerve branching. Immediately at the end of total parotidectomy, the reconstructive phase, according to the technique proposed by Prof. Biglioli, was undertaken. The removed facial nerve branching was immediately substituted microsurgically using the thoracodorsal nerve and its tiny branches (harvested from a small armpit incision). 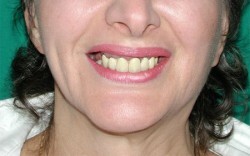 Facial nerve reconstruction allowed, after a few months, facial symmetry at rest, during smiling, and lid closure. Patient with multiple recurrences of pleomorphic adenoma of the left parotid gland (arrow). The facial nerve and its branches (underlying the red tape) displayed and stored appropriately at the end of the removal of the whole parotid gland. 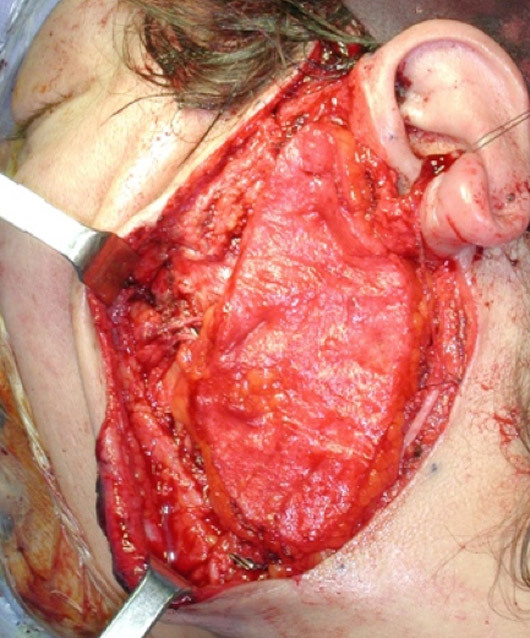 A microvascular parascapular free flap was transposed to reconstruct the parotid region to avoid unsightly dimpling. 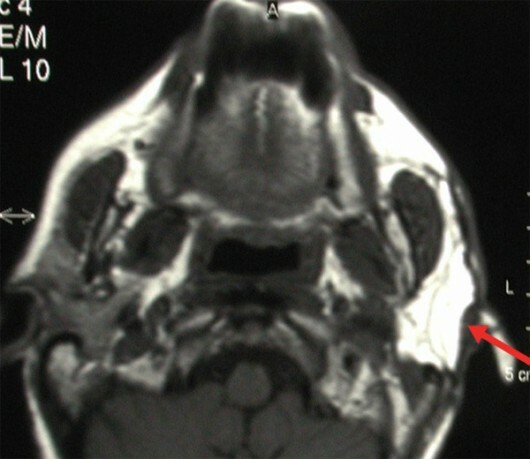 MRI 2 years after surgery shows ideal engraftment of the flap (arrow) and the fine reconstruction of the parotid region. Symmetry of the face of the patient 2 years after surgery. Symmetry of facial expressions after surgery.